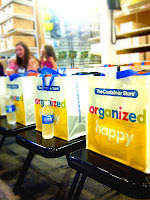 Join The Container Store for the Grand Opening Weekend Celebration of their newly located store in Buckhead Triangle (corner of Peachtree Road and Wieuca Road) and shop the world’s most celebrated collection of storage and organization products! 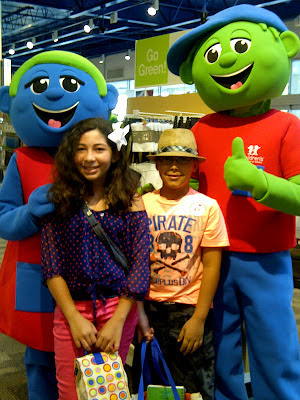 The Container Store will give away prizes every hour, on the hour, including $1000 elfa® Space Makeovers on both days! They'll amaze you with their legendary customer service and inspire you with new ways to organize your life. It’s a one-of-a-kind experience – you have to see it to believe it! 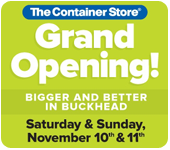 The Container Store is proud to donate a percentage of proceeds of Grand Opening Weekend Sales from the new location of our Buckhead store – Saturday and Sunday, November 10th and 11th – to Children’s Healthcare of Atlanta. Time: Saturday, November 10th from 9 a.m. to 9 p.m.
Sunday, November 11th from 11 a.m. to 6 p.m. The Container store will be giving $10 store cards for the first 100 Facebook check-ins at the Buckhead store so make sure you don't miss this awesome perk.